The folks down in Looney Hollow ain’t famous for their culture, which is most evident when one notes their favorite sport: chasing down chickens. People come from all around the Hollow to watch when two families challenge each other to a Chicken Run. The only problem is that the spectators are usually so unruly and fanatical that they feel obliged to join in the game. Be the first player to capture (put a pyramid on top of) two chickens with family members of the same size as the captured chickens, while dodging and trampling (moving over top of) unruly spectators and opposing family members. Two Treehouse sets: one of the Rainbow spectrum, one of the Xeno spectrum (or three matched sets, with an alternate setup). Any 5×9 grid of squares. A chessboard works fine, if one player is willing to have his or her pyramids start on the border (i.e. off the squares), in “imaginary” squares. 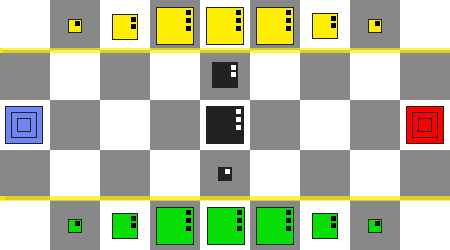 Two six-sided dice (d6), ideally one black and one white, though the players can be careful to roll into separate areas, to keep each player’s die distinguishable from the other. Set the board between the players so that the five-square-wide sides face each player. Give each player a d6 (ideally, use a d6 that matches the color that the player will be playing). Use the white opaque pyramids to build one nest (the large on top of the medium on top of the small), and use the black opaque pyramids to build another nest. 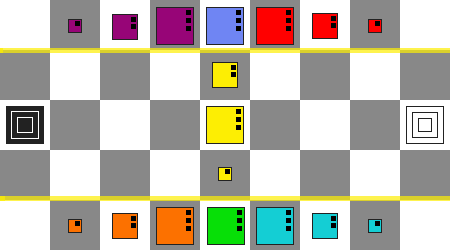 Each player takes his or her color nest and sets it on the center square of the edge of the board that is nearest to him or her. The pyramids in this nest comprise the player’s family. Note: The colors that you use for the spectators do not matter; but the placement of the large, medium, and small pyramids does matter. Chicken Run is comprised of rounds during which one of the players will get to move either his or her family or the spectators and chickens. There is, however, a slight twist to the standard turn-based play common to other games. Black’s result is higher than White’s result – This round is Black’s round to act. White’s result is higher than Black’s result – This round is White’s round to act. The results are identical values – This round is the round to act for whichever player least recently had a round to act (i.e. if Black acted on the previous round, then White gets this round to act; and vice versa). Note: If the results are identical on the first round of the game, roll again. Black’s result is higher than White’s result – Black may only move black pyramids (i.e. his or her own family). White’s result is higher than Black’s result – White may only move white pyramids (i.e. his or her own family). The results are identical values – Whoever gets to act may only move transparent pyramids (i.e. chickens or spectators). A small pyramid uses one movement point to move to an adjacent orthogonal square. A medium pyramid uses two movement points to move to an adjacent orthogonal square. A large pyramid uses three movement points to move to an adjacent orthogonal square. A player need not use every movement point on his or her turn. The family member is capturing a chicken, if the square is occupied by the chicken that is the same size as the capturing family member. The pyramid is trampling the occupying pyramid(s), if the square is occupied by non-chicken pyramids smaller than the moving pyramid. Note: Capturing a chicken is not like it is in chess or checkers: at no time are pyramids removed from the board. Rather, a capture must be maintained—tying up the family member—until the game ends or until the player who controls that family member decides to release the chicken (move off of a capture), for whatever reason. Only the top-most pyramid in a stack may be moved; a captured or currently trampled pyramids may not be moved. Family members and chickens may not leave the central 3×9 area (see the yellow lines on the images in the Setup section). A spectator may move freely around the full 5×9 area of the board. Spectators may not capture chickens nor trample family members, though they may trample each other. Chickens may not trample any other pyramid. A family member may not capture (or even trample!) a chicken of a different size. A family member must be larger than opposing family member(s) or spectator(s) to trample them (e.g. a large family member may trample a medium and/or small, opposing family member and/or spectator). The first player to capture two chickens is the winner. For example, if White captures the medium chicken with his or her medium family member and captures the large chicken with his or her large family member, then White wins.